“Arbeit macht frei” – Work sets you free. We set out to the distant town of Auschwitz from the Penderecki Center. As bus rides go, the roads were familiar: bumpy, long, but fun. The atmosphere of the bus was much more restrained and hushed, though. Auschwitz was a place that demanded respect for its symbolism of darkness in the human ambition. On arrival, many of the musicians were surprised from the juxtaposition of scenery between the camp and its surroundings. Right next to the entrance to the Auschwitz parking lot was a typical market building with houses lining either side. A site with so much history of pain and darkness being surrounded by common buildings confused me. Was this not an ominous and troubling place to live in? After all, the atrocities of the camp are hard to even speak of almost 75 years later. “Once you actually see the physical aspects of the camp, it makes you think about the people’s mental state to be able to do this” – Ash Wood,Second Violinist. Inside one of the buildings in Auschwitz one, the original camp, there were piles of hair taken from the victims of the gas chambers. Thick braids piled one on top of another. Mostly black and brown, but nonetheless human. The pile lined a long wall on one side and back along another of the same size as well. Taken into a gas chamber, the victims were convinced that they were taking a shower. Their last actions were carried out through a lie. Cutting off a victims hair to send to make into textiles brought horrific thoughts to my mind. “They didn’t know” repeated over and over again in waves of sheer emotion. All I had the mental capacity to think of was that the hair came from human victims. Not only hair, but other items like hair brushes, pots and pans, and shoes were piled up room after room. Each item was once owned by a victim that did not make it out of the camp. A hallway full of profiles also made a profound impression on me as well. Black and white faces of inmates were profiled along with their names, occupations, and birthdates. Their eyes were haunting. I tried reading what kind of emotions the inmates were going through during the picture or if they had emotions for such a horrid fact that they were so near to their death. One was a teacher which reminded of my mom. One was a lawyer. Another had a position as a judge. Each individual had a life and reality before being taken. But, they were all stamped with a number and sentenced to death. The number of profiles that were hanging struck me with no words. How do you describe the feeling of staring death in the eyes? I felt small; these victims deserved the chance to live on no more and no less than myself. Who was I to be in my place in 2018 rather than theirs during World War II? “You can read a textbook and all, but you have to go there and see for yourself” – Matthew Su, Second Violin. The whole GTCYS tour group had a solemn and reflective outlook throughout the tour. 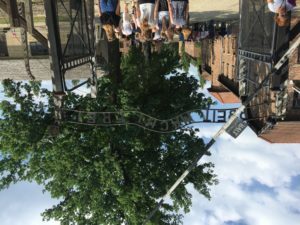 Maestro Smith and our official tour guide had warned us of the sacredness in Auschwitz. During the tour, we kept our silence and our thoughts to ourselves. “It was so amazing to see how empathetic we were as a group and as an orchestra. Every person should experience what we experienced” – David Michaeli, First Violinist. The trip to Auschwitz has been transformative and I’m thankful for GTCYS for letting us witness such a place.